1. How do Rolling and True Global exposure mechanisms compare? This animation illustrates the ‘Rolling Shutter’ exposure sequence that would occur if a 20 ms exposure time was requested through the acquisition software. It involves an initial 10 ms ‘transient’ exposure activation phase, whereby each row is activated in turn, from the middle of the sensor outwards towards the top and bottom edges. This is followed by a period during which all activated rows are allowed to expose. The final part of the exposure sequence involves a 10 ms ‘transient’ readout phase, again working row by row from the middle of the sensor towards the top and bottom edges. In this example, each row has been active to light for 20 ms. This animation illustrates the ‘Global Shutter’ exposure sequence that would occur if a 20 ms exposure time was requested through the acquisition software. At the start of the exposure, each pixel simultaneously begins to collect charge and is allowed to do so for the duration of the exposure time (20 ms). At the end of exposure, each pixel transfers charge simultaneously to its readout node from which readout occurs ‘behind the scenes’. This immediate and global start and then end of exposure explains why Global Shutter is often referred to as ‘SnapShot’ exposure. 2. What happens in each mode if ‘Overlap’ readout is activated? This animation illustrates the same ‘Rolling Shutter’ exposure sequence, but with Overlap selected. The key difference occurs during the final readout phase, as it also becomes the exposure activation phase of the next exposure. That is to say that as soon as a row is readout out, it immediately begins its next exposure. This means that during the final 10 ms, rows close to the centre of the row would be on their second exposure, while rows close to the top and bottom would still be on their first exposure. This animation illustrates the same ‘Global Shutter’ exposure sequence, but with Overlap selected. As soon as the charge is transferred into the readout nodes of each pixel for readout to begin (which takes 10 ms) the pixels are all simultaneously activated to begin their second exposure. 3. Why is true Global Shutter the same as the exposure mechanism of an interline CCD? An interline CCD, which has been in common use as a microscopy camera for several years, involves an exposure mechanism that is ‘SnapShot’ in nature, in that all the pixels of the array begin to expose simultaneously, then at the exposure end they all transfer their charge simultaneously into the shielded readout area of the pixel. If required, the subsequent exposure can begin immediately, overlapping the readout period of the first exposure. Such as exposure mode is efficient and simple to synchronise to. True Global exposure mode of sCMOS operates in a virtually identical fashion. 4. Why can Rolling Shutter not be used for applications that require time correlation across the image? 5. Why can Rolling Shutter cause spatial distortion in the image? If light is falling on the sensor during the ‘transient’ phases (first 10 ms and final 10 ms) of the rolling shutter exposure mechanism, and an object is moving during this time, then there is a chance of some degree of spatial distortion. The extent of distortion is dictated by the relative size, direction and speed of the object. 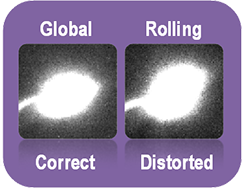 The images below show the head of a moving sperm cell, imaged by the Neo 5.5 sCMOS in both Global and Rolling Shutter. Distortion of the shape of the sperm head is evident in rolling shutter. The images below show cells captured in a hyperspectral microfluidic microscopy system, using both rolling and global shutter modes of Neo 5.5. Rolling shutter produces distortions that are a function of the velocity and field location, whereas global shutter produces diffraction-limited images independent of velocity. The animations below show (a) a rotating fan, imaged with the Neo 5.5 sCMOS in global vs rolling shutter modes. Large distortion is evident due to the size and speed of the fan blade, relative to the speed of movement of the ‘transient’ phases of exposure activation and readout. 6. Can spatial distortion be avoided in rolling shutter? There is a specific mechanism whereby rolling shutter can be adapted to avoid rolling shutter, by making sure that light is not falling on the sensor during the transient phases. This mechanism is referred to as Simulated Global Shutter, and requires use of a specific output TTL from the camera called FIRE ALL to trigger a pulsed light source (laser or LED) to illuminate ONLY during the phases of the exposure mechanism during which all rows are exposing. This introduces considerable dead time into the measurement however. 7. What are the disadvantages of ‘Simulated’ Global Exposure (using rolling shutter)? (a) Dead time – Since the sample is not being illuminated during the transient phases of the exposure cycle, this introduces significant dead time, that being the proportion of the cycle time during which photons are not being collected. This carries the disadvantage of either (a) lower signal to noise ratio due to a lower shorter effective exposure time for a targeted frame rate; or (b) from slower frame rate if the same effective exposure time is required. (b) Pulsed light source and increased complexity – The rolling shutter simulated approach to global exposure requires that the Fire ALL output from the camera is configured and used to trigger a pulsed light source. Conversely, the true global shutter mechanism can be carried out with either a continuous or pulsed light source. The timing diagrams illustrate achieving a frame rate of 50 fps using both True Global and Simulated Global exposure mechanisms. Since there are no peripheral devices, ‘overlap’ readout can be activated in each case. In this case, the rolling shutter simulated approach suffers from 50% dead time and requires that the Fire ALL output from the camera is synched to a pulsed light source. 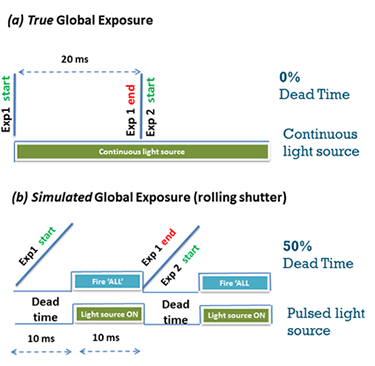 The true global shutter approach is shown using a continuous light source and has 0% dead time, i.e. photons are continuously being collected. Therefore, true global shutter offers a sensitivity advantage that is equivalent to having collected the signal with x2 higher effective QE. 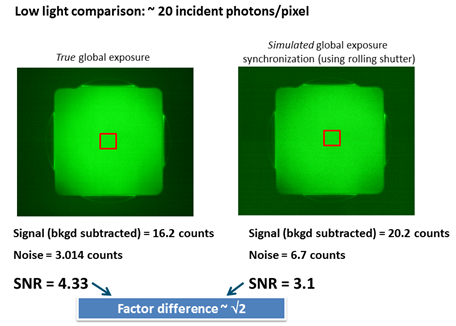 The figure below shows images recorded using the Zyla 5.5 sCMOS camera under low light conditions, corresponding to ~ 20 incident photons per pixel, recorded for both true global and simulated global modes of acquisition at the target frame rate of 50 fps. 8. What is the ‘Global Clear’ function of the Zyla 4.2? Global Clear MUST be used alongside the ‘FIRE ALL’ output of the camera and a pulsed light source to simulate Global Exposure mechanism, but carries the benefit of a reduced dead time, relative to not using the function. If the light source was allowed to operate continuously, then Global Clear exposures would result in the centre rows having 10 ms more exposure to light than the outer rows, so it absolutely cannot be used in this fashion. Note, Global Clear also differs from true Global Shutter in that it can only be used in ‘non-overlap’ readout mode, i.e. sequential exposure and readout phases rather than simultaneous. 9. 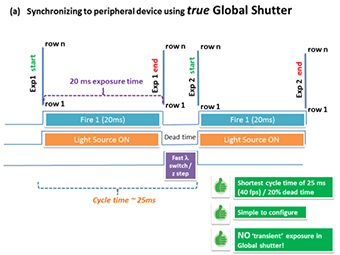 Why is true global shutter more efficient at synchronizing to peripheral devices? In the scenario described here, the aim is to synchronize to a fast peripheral device, such a z-stepper or illumination wavelength switcher. Since it is required to synchronize to a peripheral switching device, the ‘overlap’ mode of operation may be implemented in global shutter mode, but must be avoided in rolling shutter mode. Here we will examine use of true global shutter versus use of rolling shutter, the latter also using the Global Clear function of Zyla 4.2 in an effort to minimise rolling shutter dead times. The timing diagrams compare each method of fulfilling these acquisition conditions. In true Global Shutter with overlap since there is no transient phase of the exposure cycle, all pixels begin the exposure time simultaneously, and the input exposure time of 20 ms also defines the effective exposure time, the Fire 1 output from the camera activating the light source for this same duration. Note, it is possible to use Fire 1, Fire n, ‘FIRE ANY’ or ‘FIRE ALL’ in global shutter, each providing the exact same trigger timing. At the end of the first exposure, the charge from each pixel is transferred into the readout nodes of each pixel from which readout can occur. At this point, a delay of 5 ms is required for the movement of the peripheral device. However, immediately after this the second exposure can start, even though the readout of the first exposure is still progressing from the readout nodes. This is the benefit of overlap mode in global shutter. Use of true global shutter therefore results in a very short cycle time of only 25ms, yielding 40 fps, and a 20% dead time. This approach is extremely simple to configure in that the exposure time input directly defines Fire output of the camera, which in turn directly defines the period of illumination, for any ROI size. 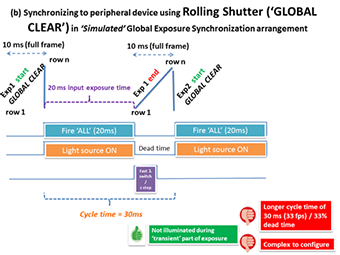 However, to achieve an effective exposure time of 20 ms in rolling shutter and ensure that the light source is only activated outside of the transient phases, it is again necessary to use the simulated global exposure synchronization method. The Global Clear function is used in order to reduce dead time in this configuration.